So it's not exactly the most aesthetically pleasing choice of music player. If I was browsing in a shop maybe I would have chosen something else. Throughout my week using the Walkman, I came to realise that I have very little knowledge of technology from the past. I made a number of naive mistakes, but I also learned a lot about the grandfather of the MP3 Player. Personally, I'm relieved I live in the digital age, with bigger choice, more functions and smaller devices. I'm relieved that the majority of technological advancement happened before I was born, as I can't imagine having to use such basic equipment every day. Having said all that, portable music is better than no music. Now, for technically curious readers, I've directly compared the portable cassette player with its latter-day successor. Here are the main cons, and even a pro, I found with this piece of antique technology. This is the function that matters most. To make the music play, you push the large play button. It engages with a satisfying clunk, unlike the finger tip tap for the iPod. When playing, it is clearly evident that the music sounds significantly different than when played on an MP3 player, mainly because of the hissy backtrack and odd warbly noises on the Walkman. The warbling is probably because of the horrifically short battery life; it is nearly completely dead within three hours of firing it up. Not long after the music warbled into life, it abruptly ended. With the plethora of MP3 players available on the market nowadays, each boasting bigger and better features than its predecessor, it is hard to imagine the prospect of purchasing and using a bulky cassette player instead of a digital device. Furthermore, there were a number of buttons protruding from the top and sides of this device to provide functions such as "rewinding" and "fast-forwarding" (remember those? ), which added even more bulk. As well as this, the need for changing tapes is bothersome in itself. The tapes which I had could only hold around 12 tracks each, a fraction of the capacity of the smallest iPod. "I remembered it fondly as a way to enjoy what music I liked, where I liked," he said. "But when I see it now, I wonder how I carried it!" 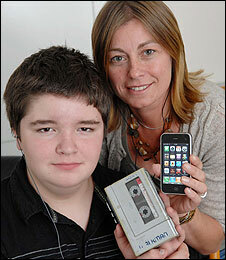 But it's not all a one-way street when you line up a Walkman against an iPod. The Walkman actually has two headphone sockets, labelled A and B, meaning the little music that I have, I can share with friends. To plug two pairs of headphones in to an iPod, you have to buy a special adapter. The Walkman player I had was barely bigger than the cassette itself -- a triumph of miniaturization and I had the gadget for many years. I also bought a DBX portable player to play the DBX cassettes I had made from LP's and FM radio. It's noise reduction and dynamic range compression/expansion was 2:1 instead of the measly 20% offered by Dolby (in the improved Dolby2, only the high end was compressed and expanded). 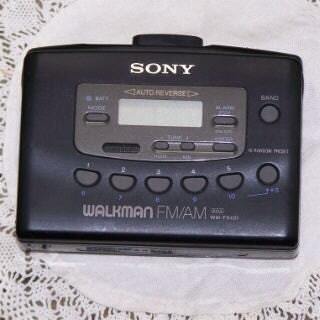 Then the first CD portable Walkman came out and it was huge with six D cells batteries running it. It unfortunately conked out before the year warranty and I got a credit towards buying the CD Walkman which was also barely larger than the software and I still haven't gone MP3 -- I have a Panasonic CD player. 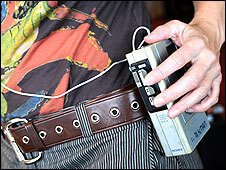 I suppose the shirt pocket portability of the MP 3 players and huge library one can download is it's redeeming feature but my old Sony 10 Walkman was also shirt pocket portable, but, of course, you had to also carry a cassette wallet loaded up with favorites. The I Phone and it's Sony (and other brands) competitors is really the only portable gadget which I would buy. I still have mine and it works great. It's my tapes that have started phasing from being so old. Listen old man, be careful what you say on these phones. Our signal could be picked up, and our devisous plan to control the stock market will be found out. I recall the days even before Walkman's when we had to walk around with transistor radios with the single ear attachment. I thought even that was cool! Back in those days you could get 10 songs on a cassette or LP. Today you can get 1,000 songs on something as small as a credit card. Nice story, dj! Brings back memories, even though I didn't have one of those. I did, however, have one of the first VCRs that came out. I remember paying something close $1300 for it! 30 years from now, will the iPod look as clunky by comparison to the gadgets of 2039? My prediction for the future... the "device" will go away completely. Music will be downloaded (along with the software to play, find and organize it) directly into our cortical implants-- which of course will be controlled by our thoughts (the most natural interface imaginable). "What was that song again... yeah that was it... let me think it to you". Well yes... but I was thinking more along the 30 year timeframe than the 200 year timeframe.